Over thirty years in gaming has meant that there are lots of candidates for today’s entry, split mainly between games acquired at conventions (and I think that I mentioned 'The Flaming Eye' and 'Wordbuilder’s Handbook' earlier), games bought in the late 1990s at Best Books & Games in Liverpool, 'Traveller' material bought through BITS old auctions when I was filling out my collection, and then eBay and other sales site (especially when I was after 'Pendragon' books). 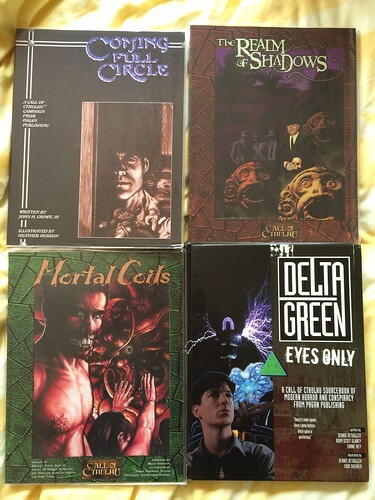 My most strenuous searches were from some of the material produced by 'Pagan Publishing' for Call of Cthulhu. 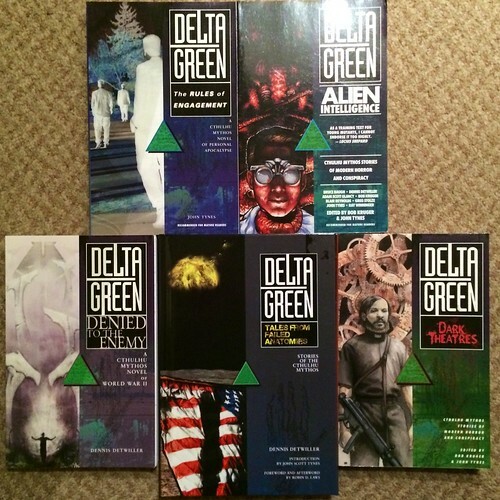 I hunted high and low for the old 'Delta Green Chapbooks' at a sensible price, ultimately unsuccessfully, but in the end backed the Fundable campaign (an earlier take on Kickstarter and Indie-go-go that failed.) for the collected hardcover versions. I also looked hard (and found) their scenario and campaign books such as 'The Realm of Shadows', 'Mortal Coils' and 'Coming Full Circle' but there was one that always escaped me. I’d lose bidding wars on eBay, and never found it in shops. The few conventions that had it were asking silly prices. 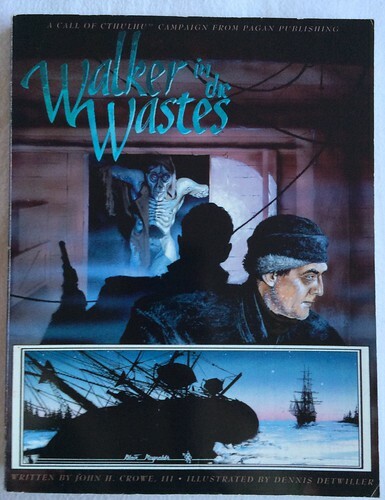 Anyway, recently Angus was clearing some of his old games, and I finally managed to get myself a copy of 'Walker in the Wastes'. It hasn’t made it into an archive cover yet, not has it been read (but it’s sitting in the ‘to-read’ pile), but I hope that it likes up to the anticipation of a decade long hunt! I choose 'The One Ring', by Cubicle 7. It triumphs over Chaosium’s 'Elric!' (reprinted and expanded as 'Stormbringer 5th Edition'), but only just. 'Elric!' is a game that I spent a huge amount of time playing being the fourth iteration of the 'Stormbringer RPG' that had won my heart for its chaotic, power gaming, devil-may-care embrace of Michael Moorcock’s 'Eternal Champion' sequence. 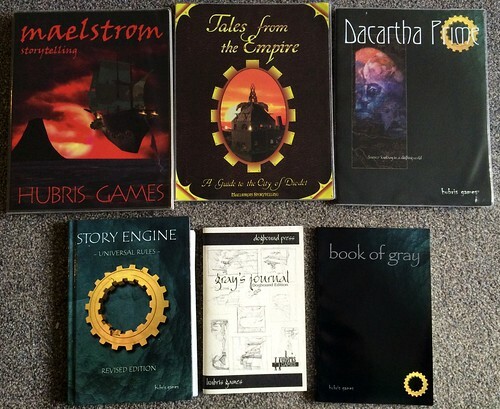 I still hold the game engine as one of the best iterations of the BRP d100 system, and some of the supplements were superb (for example the third party 'Corum' book). I spent several Continuum/Convulsions as Loz’s only friend at the Eternal Champion seminar (I exaggerate a bit). I ran an extended campaign with a number of people here on Facebook for some years - Derrick, Duncan, Andrew, Charles, Sarah-Jo to name a few and it was great fun. Two things eventually broke it for me. Firstly, time. One of the scenarios (‘The Fang and the Fountain’ from 'Perils of the Young Kingdoms') had a brutal, power-wielding, conclusion which was truely epic. But the battle took 7 hours. When you get maybe 8 hours of gaming every two months with a group, this took too long. I thought I’d found a solution when I accidentally managed to write a 23,000 word conversion of the game to 'HeroQuest', which was going to be published as a Continuum con book, but then the rights moved to Mongoose and I lost heart. The campaign ended with a whimper… Recently, I’ve started playing with a house 'Wordplay' port, and my old material may appear again. Maybe. Anyway, 'The One Ring'. Quite simply, this nails the feel of Tolkien’s 'The Lord of the Rings' and 'The Hobbit' and puts you in a position where you can run a campaign without fear of the epic story intimidating or trampling over you. It is evocative, and the system quite simple. The default setting is between 'The Hobbit' and LotR around Mirkwood, and the writing is gorgeous. I mentioned 'Rivendell' back in the 4th entry. The standard of that book resulted in me re-reading the Core Rules (revised), 'The Heart of the Wild', 'Tales from Wildland', 'The Laketown Guide' and 'Words of the Wise'. I only didn’t re-read the superlative 'The Darkening of Mirkwood' because I only just read it only and it was still fresh. I rarely binge on RPG systems like this, and it really gives me an itch to run or play it. Simply superb. Now this is a hard one, as there have been so many memorable adventures out there… I’m going to limit this to something that I’ve run, rather than just read or played, as that cuts the field down somewhat. I’ve always had a soft spot for 'Masks of Nyarlathotep' for 'Call of Cthulhu'. I bought it second hand when I lived back in Holmes Chapel from a group of gamers over there and started to run it twice. 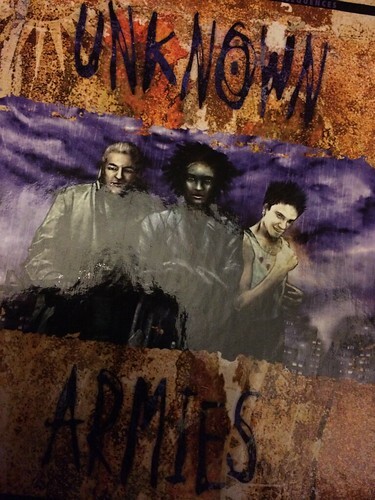 It is a great epic adventure in the horror genre, but very messy in terms of character mortality. It’s possibly only challenged by the recent Pelgrane Press release 'Eternal Lies', or maybe Chaosium’s 'Beyond the Mountains of Madness' (although that needs a certain mindset). As a GM you need to make sure that the players have ‘corresponding’ friends so that they have an easy excuse to introduce new characters. In both the campaigns attempts I made to run this, the original party had all passed away or gone non-functionally insane by the time that they reached. As a result, I don’t think that this makes the cut. What else? Well, 'I6 - Ravenloft' for 'Advanced Dungeons & Dragons 1st Edition' was a very different classic adventure. Dark horror with a very dangerous enemy. It had all the classic horror tropes, and actually makes players with high powered characters scared for their survival. Great scenario, but I’ve not touched it for a long time so not that. One of my favourite scenarios ever was 'Phantom of the Northern Marches' for 'Middle Earth Role Playing (MERP)'. It was so evocative and epic, and really reflected the lower power sad beauty and feeling of the northern realms of the Dunedain as they slowly crumbled before the power of the Witch King of Angmar. This was a non-epic scenario that made the players have a chance to feel completely heroic. Lovely setting, lovely writing, lovely scenario. But not my favourite. If I had allowed scenarios that I hadn’t run, then the 'MegaTraveller' supplement 'Hard Times' would be a strong contender. This puts the players in the position of ‘keeping the flame’ as the Imperium collapses during the Second Civil War under infighting and factionalism. The characters have a ship and can make a difference to a small number of worlds. Absolutely brilliant writing and a great campaign; incidentally, it’s one of the reasons that I really didn’t like Virus with Traveller: The New Era was released as it wiped all these efforts out. But I’ve not run it, so it’s not in the running. I think that I will go for a campaign pack that has given me hours of fun as a GM, is broad enough that you can do pretty much anything with it, and was really the first book to give my favourite RPG the true flavour of it’s setting. 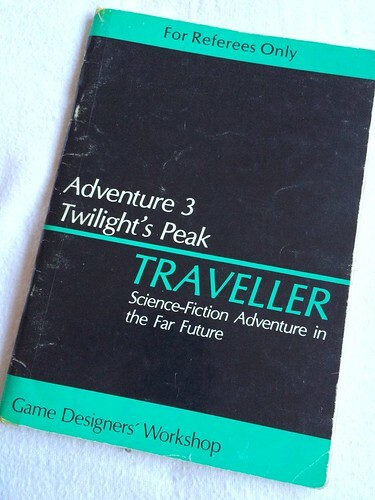 I am talking of the Classic 'Traveller' Adventure 'Adventure 3 - Twilight’s Peak'. This is a campaign framework for a group of players to take a starship that has seen better days along the Spinward Main, ostensibly to earn enough cash to properly refit it. But they also get a great big hint about lost treasure which could make their fortune. They may, or may not, stumble upon this. I’ve run it twice and one party found it, the other didn’t. But it doesn’t matter; you soon come to the realisation that the journey – the Travelling - is actually the most important thing. This is still usable with the current versions of 'Traveller', and if you get the Classic 'Traveller' DVD [from Marc Miller] then you are set for hours of fun as that has all the other published adventures to mesh around it too. I find this quite an interesting question, as sometimes the system is fundamentally meshed with the setting. 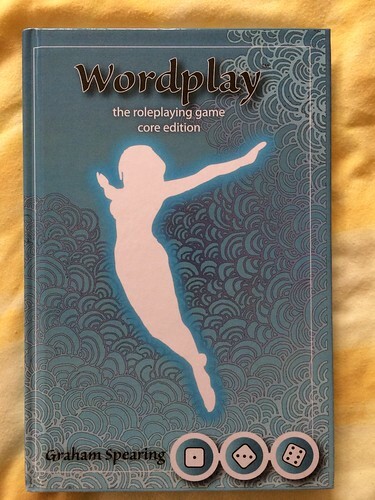 However, if I had to pick one game system as a favourite, it would be 'Wordplay'. Developed by Graham S and the group of Sheffield gamers which I used to play with regularly, this is a game dear to my heart. I spent a lot of time involved in play testing and also in helping to develop parts of the system. 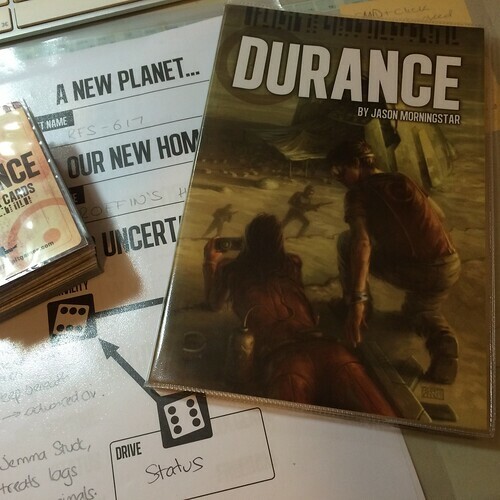 I also proofed and laid out the game for publication. At its heart, 'Wordplay' requires you to build a hand of ordinary common-a-garden six sided dice. You throw these, and each 6 gains you two successes, each 4 or 5 gives one success, and 1-3 gives you nothing. You then compare the difference in levels between an opponent or a fixed difficulty, and the wider the gap, the bigger the success level. In many ways, 'FATE' works in a similar way, but that wasn’t an inspiration for the game engine. You build the hand through taking a trait (which is rated in numbers of dice that go into a dice pool) and then potentially picking up to two supporting traits (which add a reduced number of dice based on their original levels). Other players can help by lending you a helping dice from their character. 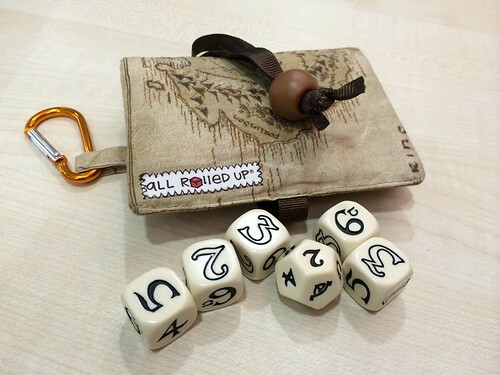 You can also gain dice from equipment and the environment. You can create temporary traits through narration or action that can also help. 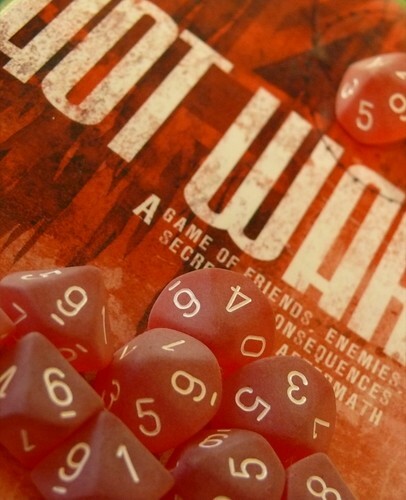 Nothing ever takes dice away from you; you can only ever gain dice. Even if you are wounded, you do not lose dice. Say you had 'Broken Arm (3d)' and that trait would act against you in a task, then you would give your opponent 3 extra dice. One of the sweet things in the system is that you can see who helped or hindered you. Final task resolution effectiveness can be gauged from a table - in all cases, a 7 success margin is a total victory. 'Wordplay' sits firmly on the fence between contest resolution and task resolution. You can use the system in either way; either frame the outcome you want to achieve, or approach it like a traditional RPG and roll with the dice at a more granular level. You can resolve with a single roll, or have an extended contest. The use of descriptive traits makes it really easy to build characters and adventures. The dice mechanic is quite clever, as it engages gamer instincts in building a hand of dice, but the process is quite swift. The outcome supports narrative resolutions, and the whole system hits a sweet spot for me. 'Wordplay' deserves more recognition than it has, and hopefully it will get it soon. Currently, the PDF and POD book sit at [Lulu.com], but the intent is to migrate them to RPGNow/DTRPG in the near future. There are two supplements nearly completed, so hopefully the game will gain in popularity. So that, ladies and gentlemen, is my favourite game system. And yes, I also love the bell curve functionality of 'Traveller' and the d100 simplicity of the Basic Role Playing engine which started at Chaosium. But 'Wordplay' is now my go-to system. Undoubtedly West End Games' ‘Paranoia’. Dark, apocalyptic humour set after an atomic war, where the players are all clones who live in a complex controlled by 'The Computer'. I started playing this with the first edition, but my heart was taken by the revised and simplified second edition that Games Workshop released as a hardback. I lost touch with this game after school, and I wouldn't mind running or playing it again. Ok, so I use the Mongoose rules these days (which are a retooled update of the original little black book classic Traveller and the later MegaTraveller) but the setting material and plot can still be used with minimal effort. I love the blend of Andre Norton, EC Dumarest, Azimov's Foundation, Sir Arthur C Clarke and more, combined with a hint of Star Wars, with which is shared a release year. 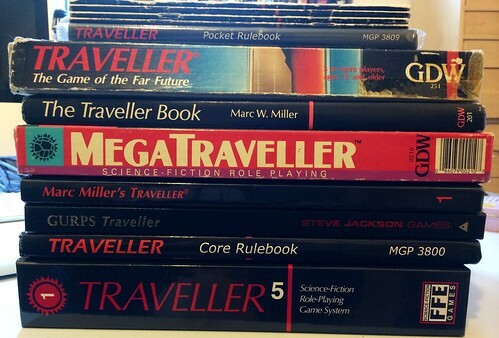 In a lot of ways, Traveller became an archetype for other systems with careers and past experience and no-levels a la D&D. Surprisingly modern and still effective. Undoubtedly, it has to be the Delta Green tie in set of novels and short story collections, especially The Rules of Engagement. They capture the weird blend of Lovecraftian horror, despair and hints of the X-Files and Millennium perfectly. Probably Kingdom or Durance or Fiasco. One of the indie storytelling games that has minimal demand for dice but a lot of expectations for behaviour and approach. When they work, they’re brilliant. When they don’t, they are dire. And sometimes they go somewhere in the middle, which is disquieting. Well, I still have AD&D 2nd Edition and some supporting material from Basic, 1st, 2nd and 3rd. And the original little black book Traveller sets. 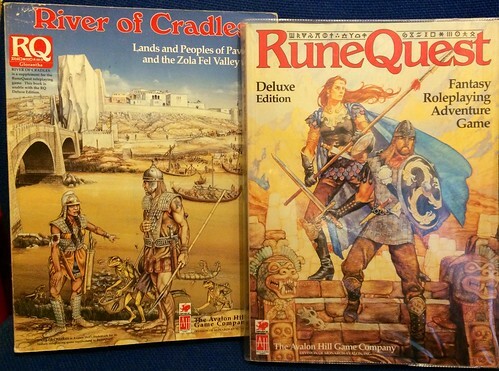 And RuneQuest 2nd Edition, Stormbringer and Call of Cthulhu 2nd Edition. And Ringworld and Pendragon 1st Edition. And there are probably others lurking there. What do I use of those? Traveller. The system (except for combat) remains pretty light and compatible with the present Mongoose rules. The setting material is still valid too. 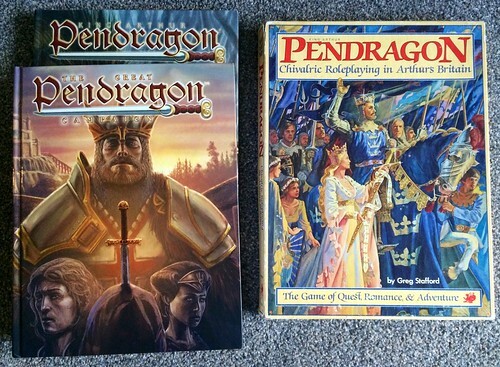 The Pendragon and Call of Cthulhu material can all be used if I ever get the chance to game in those settings again without modification. Lately I have been revisiting the D&D material with a view to using it with the Dungeon World indie gaming take on it. And I have resisted the siren call of D&D 5th Edition so far. Update: 31/8/2014 D&D5 appears surprisingly well written, simple and clear. My second choice game, which wasn’t there either! So Call of Cthulhu it was. This is not a collector quality copy. 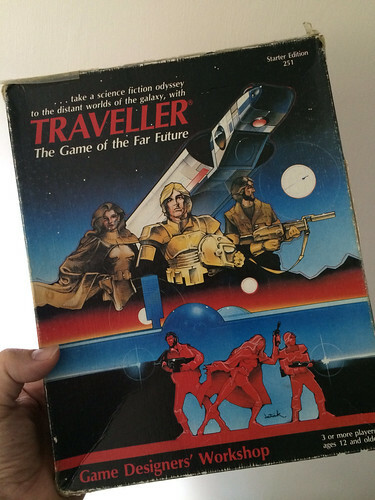 This is a well used, well worn and well loved copy of Traveller complete with sellotape patching. 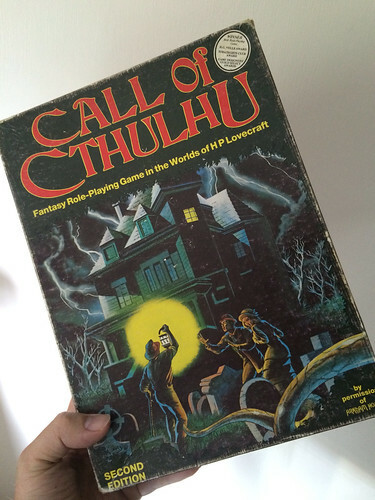 The first RPG I purchased was Chaosium’s Call of Cthulhu which I spent my birthday money on in a little shop in the Arcades in Chester when I was eleven years old. I also picked up copies of the collected Lovecraft that Penguin had issued around the same time. I think I got those through WH Smiths back in the day when it was still a decent bookseller. I didn’t want to buy Call of Cthulhu. I wanted either the D&D set I had seen at the local toy and gift shop (“Rainbow” in Holmes Chapel) or a copy of Starter Edition Traveller. My passion for these had come from reading What is Dungeons & Dragons? (by Butterfield, etc. ), especially the split text walk through of the Shrine of Kollchap dungeon included in the book. However, Rainbow had sold its copy, and the shop in Chester only had Call of Cthulhu, which kind of set me on my course. As an aside, my mother tells me I was very cross that the copy of D&D had sold, and she had to keep a straight face as she had bought it for my aunt to give me as a Christmas present. We played Cthulhu a lot around 1983, and I enjoyed it a lot. However, by the time the 3rd edition hardback book shipped, I was bored by it. You couldn’t get the same fear and terror, because everyone else had bought and read the rules. So I put it aside for some quite some time. My first copy of D&D - Holmes Basic - picture found on internet as I no longer have it. 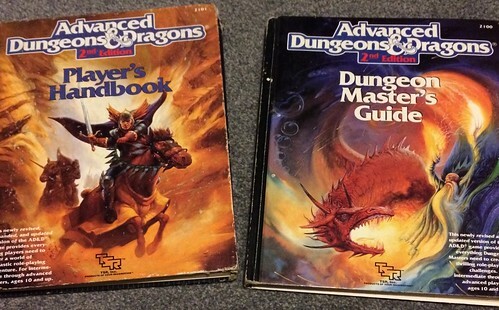 The first RPG that I played, as opposed to ran (I was a Games Master before I ever played) was Basic D&D. If I remember, it was the Red Box version that was compatible with the Expert and Companion rules that were released later. My friend Ged was the DM, and we started with B4 The Lost City, a classic adventure set in a pyramid. I don’t remember a whole lot except kicking open doors, throwing in ceramic flasks of lamp oil followed by a flaming torch if we saw something that looked too dangerous, and getting hopelessly lost. I’m not sure if we ever completed the adventure or died horribly. We played at lunch time at secondary school, a Catholic Comprehensive in Cheshire, and the RPG club we had was sponsored by our RE teacher, of all people. She was a young teacher who had recently qualified, and the idea of gaming wasn/t anathema to her as she had come across it before. She let me form an official club and use her classroom every lunch time. I’ve lost touch with most of the gamers from that time with the exception of Mike S and Mark H who I keep touch with distantly through Facebook. Happy days. These entries will be cleaned up versions of my posts on Facebook.